Lovely new 2019 Browning B725 Hunter UK Black Gold II. The Black action is complemented by Gold Partridge and Pheasant. The 3" chambered barrel is Steel shot proofed. Superb new 2019 'Mark II' variant of the Browning B725 Sporter. With facelift silver action and red detailing this brand new model is supplied with a full set of Invector DS Extended chokes as standard. 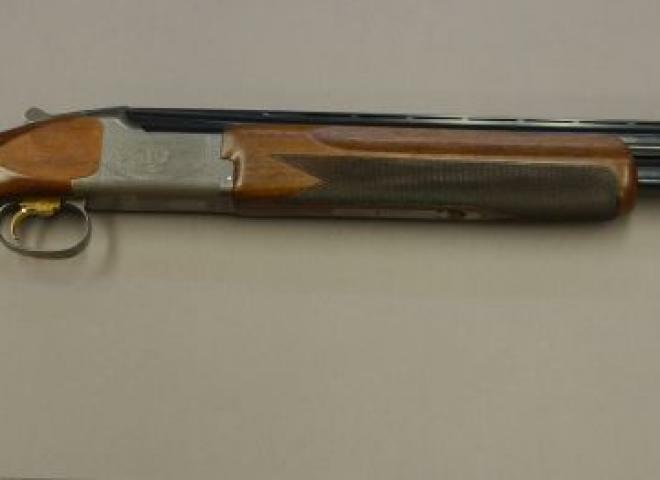 Brand new example of the Browning B525 Sporter One. Brand new 2019 Browning B725 ProSport. Range topping B725 with Grade 5/6 american walnut, black receiver. Matt black invector bore barrels with tapered sporting rib. Rounded fore-end and deep pistol grip. A very nice and well cared for example of Beretta's stunning 687 EELL Game gun fitted with lovely figured walnut and hand engraved side plated action. A very well cared for example of Beretta's highly sought after 687 Silver Pigeon V with gold inlay game scene engraving set against a colour hardened action. New model from browning featuring a laminate stock with adjustable comb. Supplied with 4x Midas extended chokes, choke key and hard case. New Miroku MK 38 Grade 5 Trap, an iconic trap gun with fixed full and 3/4 chokes. Miroku cardboard box. Strong action with concealed third bite. Powerful ejectors. Relatively heavy with long chambers, so would be good for heavier cartridges. Brand new Beretta 690 Sport Black Edition. Featuring Grade 2.5 Walnut, very nicely figured. These guns feature the 690Series action and over bored barrels. A beatiful sidelock from Felix Sarasqueta.The gun is as original & has not been tampered with in any way. The stock measures 14 3/8" from the front trigger. exquisite high selected grade 5 american walnut with teardrops fitted to stock and oval. Attractive premium grade 2.5 walnut with microcore pad. Good condition Kofs .410 O/U, sold new by us in May last year, great value gun & fun to use! 01223 837977. A superb handling example of this popular model from Beretta in very good condition throughout. A well made Turkish Gun at a great price and proven reliability over many years of sales in the UK, this gun comes complete with 5 chokes and is a great little gun for a bit of game and clay shooting. A Browning 425 grade 5. This gun comes with 32" multi choke barrels with spare chokes. A 14 1/2"stock. Please note this gun has a hairline crack in the stock. Enquire about the possibility of a custom stock. A Miroku 7000 SP1. This gun is in good condition for its age. 30" multi choke barrels and a 14 1/2" stock. A superb light weight Boxlock, non ejector 16 gauge by Thomas Horsley and Son of York. This little game gun is in excellent condition and would make an ideal choice for walked up days. Stunning wood, retaining some original colour hardening and charcoal blue. In maker's canvas case. New, Game With 5 Chokes and Key and Adjustable Stock. A good example of this classic shotgun from Beretta with 26.5" barrels, this would be an ideal gun of choice for shooting from a pigeon hide!